PEX Summer Fest Updates! 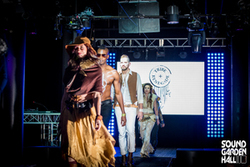 Fashion Show 2016, NEW Philly TRANSPORT and Frank's Hostel is back! Art Grants have been awarded!!! Though all the information is still being processed here’s a special sneak peek! 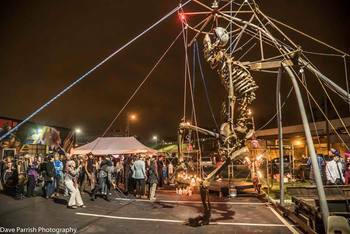 This year Josephine the Colossal Skeletal Marionette will be joining us at PEX Summer Festival! Josephine amplifies some of the strangest structural and skeletal details to epic proportions for our amusement. At her most abstract, she is a way of playfully engaging the macabre. The ease with which participants can manipulate the colossal puppet leaves an indelible, energetic impression on those who choose to interact. Either individually or as a group, the energy of you mortals pulling on the ends of her ropes is multiplied many times over as cables, pullies and bones animate and flail and dance in wild directions. Stay tuned for more info on Art and Workshops at PEX Summer Fest! Calling all designers, by trade or by hobby! This year a Fashion Show is being organized at PEX Summer Festival by members of our community including Heathenswear, Proper Playground and the Bohemian Fox. We wish to feature any and all wearable art procured from the PEX community. Featured designs will be limited to *handmade* items only. There are a limited number of runway spots available for this event so please make your runway submission before May 31st. Time, date and location TBA. How are YOU arriving at PEX Summer Festival? We’ve added a new bus route directly to Ramblewood from Philadelphia, PA. $40 roundtrip. Have fun with old friends and meet new ones! Leaves Philadelphia Friday, July 1 at 10 am. Heads back to Philadelphia Monday, July 4 at noon. Pickup and drop-off location is Front and Thompson Streets in Fishtown. Parking space is limited. Consider the Bus! Help us keep down the number of cars on site so there's more room to dance! 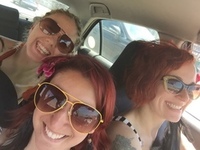 Group Carpool is a website designed to help you find friends to carpool with Because traveling is always more fun when there are friendly shenanigans involved!! Sign up today as either a driver or a rider! Read more! FRANK'S OLD TIMEY HOSTELS RETURN! Frank's Old Timey Hostels will once again be nestled smack dab in the middle of ArtCabin™ Row. Book a bed in a shared dorm at the hostel and as ol' Frank would say, "when you're in the same boat, strangers don't stay strangers very long." 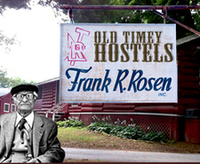 Only 28 beds available in Frank's Old Timey Hostels. Reserve your bed TODAY!